Fascinating previews of Fridays concert. Thanks for posting tootull. Attuned to organs and choristers, a cathedral will resound to a different beat this week, says David Whetstone. AMONG the carol services at St Nicholas Cathedral this week is something which might seem incongruous – an appearance by Ian Anderson, wild flautist of Jethro Tull. Often the City Hall has throbbed to Tull’s high-volume folk-rock. But this is a cathedral. Will the stained glass take the strain? In Newcastle to assure the Dean and Chapter that everything will be fine is the Rev George Pitcher, who also has a slight air of incongruity. He talks with the easy charm – and occasional profanity – of the Fleet Street hack that he was. He apologises for not sporting the dog collar of the Anglican priest that he is. One-time award-winning industrial editor of The Observer and high- profile PR man, he was ordained into the Church of England, became curate of St Bride’s, Fleet Street, the journalists’ church, and for much of 2010 was in charge of public affairs – spin doctor, some called it – for the Archbishop of Canterbury. He still keeps his journalistic hand in, blogging, tweeting and occasionally stirring up a hornets’ nest. And here he is at the Cathedral Church of St Nicholas extolling the virtues of a celebrated rocker who doesn’t openly profess to a belief in God. Of himself, George says: “I’m an Anglican priest and a freelance journalist, but I’ve followed Jethro Tull since my school days. One Christmas, he says, he got Greg Lake – of supergroup Emerson, Lake & Palmer – to come to St Bride’s and perform his evergreen 1975 hit, I Believe in Father Christmas. “There’s a melodic break and I got Ian to come and play that on the flute. It was gobsmacking. Greg Lake and Ian Anderson! The relationship between rocker and priest is intriguing, even if the priest has supped with Fleet Street’s finest and the rocker, as George says, “does not play to the rock ‘n’ roll image”. While not a church-going Christian, George sees qualities in the Jethro Tull frontman which suggest he is not beyond redemption. “He’s not terribly keen on us organised Christians, but I’d say he’s a man of great spirituality. “He’ll read from St Luke’s (gospel), we’ll have a blessing and a prayer. It’ll be ‘Ian Anderson plays the Christmas Jethro Tull’ but with some sacramental stuff in there. North East favourites Kathryn Tickell and Bob Fox will guest star, but everyone knows 90% of Jethro Tull is Ian Anderson, and he’ll be the event’s powerful presence. Buoyed by its success, Ian went on to perform in Exeter and Canterbury cathedrals; then, last year, Coventry, Salisbury and Manchester. Newcastle and St Bride’s are to benefit this year. “There isn’t a cathedral that doesn’t have an organ or a roof that needs repairing, and Ian underwrites the whole thing,” says George. “He picks up the tab and doesn’t make a penny out of it.” George, who reconnoitres each venue and persuades Church of England colleagues that a rocker’s what they want for Christmas, jokes: “I don’t know if Ian feels he’s got some ground to make up. another excellent piece from dave whetstone with whom i have worked alongside for many years!!!! I expect everyone will be on best behaviors and stifle requests for Aqualung and Locomtive Breath but I still really hope someone will have the courage to make a clear, audible request for 'Give Till It Hurts'. The Christmas concert at the Cathedral Church of St Nicholas in Newcastle is having the rock star treatment this year with the addition of the legendary Ian Anderson. 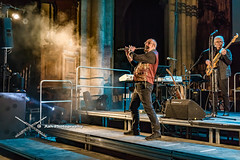 The Jethro Tull leader will be performing a prog-rock Christmas concert at the cathedral this coming Friday. Michael Stoddart, Director of Music at St Nicholas, said: “It’s terribly exciting. It’s a great way of bringing together all sorts of different aspects of life. "It’s not often you can bring together classical, rock and religious music under one roof and that’s what makes it very exciting. And what a great musician to be working with. “It brings a whole new dimension to what we can do in the cathedral, especially with the new lighting and the effects which they will bring. Anderson and Jethro Tull remain one of the most unique British rock acts. Anderson, who is credited with introducing the flute to rock music, regularly performs to support churches and cathedrals. Previous performances have been held in Salisbury and Canterbury cathedrals. Proceeds from this Friday's concert will also go towards St Nicholas's cathedral funds. Anderson will be joined by local musicians, Bob Fox and Kathryn Tickell. He said the concert offered audiences a chance to celebrate the Christmas season in great style. “Bringing a different audience to the experience of the Anglican Church traditions offers them the chance to feel involved with their local church or cathedral life," he said. "No, I am not a true-blue Christian but I support the Church and value our great traditions of faith and worship. "Even more, I value the architectural heritage of an age which will not come again. Once the roof falls in, it will turn into a block of flats or a Starbucks." The evening will include carols, classic music and several Jethro Tull tracks, including the 1971 classic Aqualung, which will be accompanied by an introduction played on the cathedral organ. “As the organ and choir are integral to the Christmas Carol service, it feels appropriate to include them in the mix. As we do with prayer, blessing and readings," he explained. Don't give The Cathedral idea's, or they'll be thinking of handing us collection plates. st nicks is only over the road from my office so i might keep an ear out for them rehearsing on thursday! You might even be lucky enough to hear the organist having a go at Thick as a Brick. Thanks Patti. I'm setting off now, think I need my wellies though, it's raining cats and dogs! I'm getting excited looking forward to a great night. Good timing...Expect your reviews, John, Snaffler and Ash, just in time to brighten the last night of hannukah tomorrow. i got into the soundcheck and sat a pew at the front listening to the old boy singing jack in the green and christmas song. this was almost better than the show!!!! Despite glares from my wife who told me "not to pull out my camera", I did take the chance of eternal damnation and took this video. Not the best quality but I hope it sets the scene. On a cold wet night in Newcastle I managed to get a seat up against the wall in the south Transept with the odd drop of rain water leaking from the roof, hopefully the proceeds from the night will pay for the repair. The concert got underway with Ian's version of "God rest ye merry gentlemen" followed by "We three Kings" where the choir of St. Nicholas sang beautifully. They got there chance to show how good they are with a perfect version of Steeleyespan's "Gaudete". Ian and the band played "Jack in the green" and "A Christmas song" before the very talented Kathryn Tickell played " The battle of Otterburn" on Northumbrian pipes, she followed with a reading. Bob Fox sang "The Bonny Gateshead Lass" and "Child Of Mine". The first half was brought to a close with "Bouree". After the break Ian and the band played a medley of "The Holly and the Ivy and Hark the Herald", there was a duet with Ian and Kathryn and another song and a reading from Bob Fox before the organist Michael Stoddart got his chance to play the Cathedral organ with "Toccata and Fugue" where Florian gave a great performance on guitar. The Cathedral organ introduced "Aqualung" (see video in previous post) before we were treated to an encore of "Locomotive Breath". A magnificent night of classical, folk, sacred and rock music which for me was a perfect start to Christmas. Very many thanks for the reviews guys - Truro next year I hope. Btw John, you didn't accept any sweeties did you? Oh that sounds and looks so beautiful I'd never miss any of these Christmas concerts if i was able to and hopefully I will soon. Thanks for the video and I liked the special effects at 2.20. No, but I would have settled for a cup of cocoa. Sounds like high quality...if not much in the way of quantity...Don't worry yer pretty little head about eternal damnation....your friends will be there with you to pass the time....per Dante, Jews get sent to level 6 of hell...dunno if I'll be booked there or somewhat lower for my personal sins beyond Judaism.....call or text when you get settled in...I know a guy who knows a guy who has some asbestos suits and electric fans. THEY may be more used to the harmonious tones of the Cathedral choir. But hymn-lovers on Tyneside were treated to a special rendition of prog-rock hero Ian Anderson. The Jethro Tull jigger was supported by the choir from St Nicholas Cathedral as he performed a special Christmas concert. Alongside his friends Kathryn Tickell and Bob Fox he staged a charity gig to raise cash for the cathedral. Carols, classical music and Jethro Tull tracks all boomed around the beautiful venue. And they even performed the band’s most famous song, Aqualung, complete with an introduction played on the cathedral organ. The song featured on the album of the same name in 1971. Famed as the man who introduced the flute to rock music, Ian said: “Bringing a different audience to the experience of the Anglican Church traditions offers them the chance to feel involved with their local church or cathedral life. A couple of the least blurry photographs I took at St. Nicks. Pleased you enjoyed the night. Thanks Ash for the images & Bunkerfan for the images/youtube videos. if ever there was a review where the reviewer was not within 100 yards of the show this is it!! i know dan very well and i know for a fact he wasnt there, but then again if a journalist can report on the vietnam war from a paris cafe......!!! I'm shocked...shocked to learn of journalistic lack of integrity...sounds as implausible as a phone that takes pictures...but seriously folks....good to see Ryan in a non-Brick outing...bodes well for possible future collaboration.